atonal bHLH transcription factor 7 is turned on in retinal ganglion cells as they transition from proliferating neuroblast to differentiated neuron. The atoh7 promoter in this transgenic line drives the expression of a membrane tagged version of RFP so the axons of the RGCs are also labelled so the optic nerve and tract projecting from the retina to the optic tectum can be distinguished. Retinal ganglion cells, cilliary marginal zone, retina, optic nerve. optic tract, optic tectum. Polarization and orientation of retinal ganglion cells in vivo. Tg(slc17a6b:DsRed) in cyan; Tubulin in green; SV2 in magenta. Tg(slc17a6b:DsRed) in cyan; Tubulin in green. g(slc17a6b:DsRed) in cyan; Tubulin in green; SV2 in magenta. g(slc17a6b:DsRed) in cyan; Tubulin in green. glutamatergic neurons, olfactory epithelium, olfactory bulb, pallium, subpallium, dorsal habenula, ventral habenula, preoptic area, prethalamus, pretectum (AF9), optic tectum, trigeminal sensory ganglion. 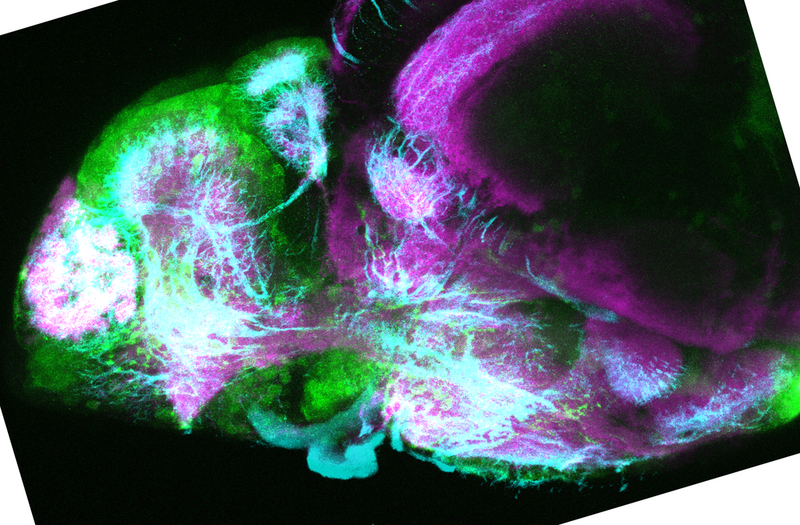 From the olfactory bulb to higher brain centers: genetic visualization of secondary olfactory pathways in zebrafish. The Journal of neuroscience. 29(15):4756-4767. Kani, S., Bae, Y.K., Shimizu, T., Tanabe, K., Satou, C., Parsons, M.J., Scott, E., Higashijima, S.I., and Hibi, M. (2010) Proneural gene-linked neurogenesis in zebrafish cerebellum. 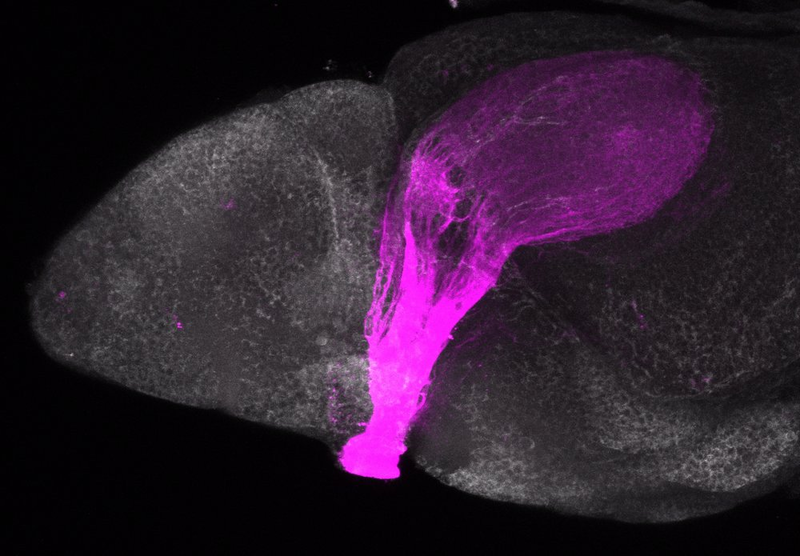 a Gal4 enhancer-trap line form the lab of Koichi Kawakami that labels olfactory sensory neurons, hypothalamus and pituitary. olfactory sensory neurons, olfactory bulb glomeruli, hypothalamus and pituitary. 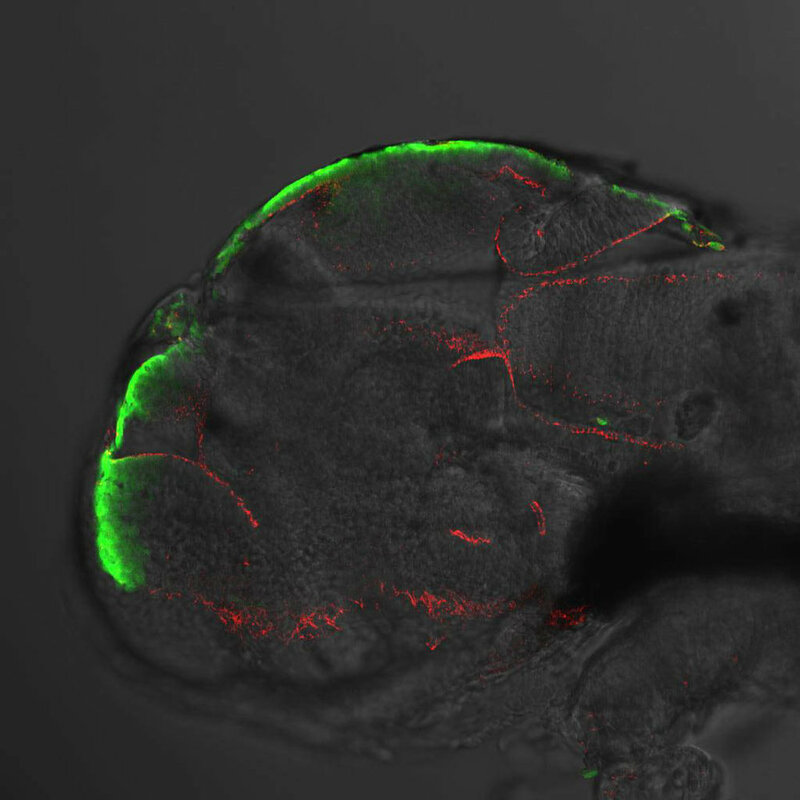 GFP enhancer-trap line from the Kawakami lab that labels the olfactory bulb, pallium, habenula, optic tectum and cerebellum and hindbrain. olfactory bulb, pallium, habenula, optic tectum and cerebellum and hindbrain. Previously called glycine transporter 2 now named solute carrier family 6 member 5(slc6a5), this trangemic line labels glycinergic neruons. glycinergic neurons, spinal cord, pineal, hindbrain. 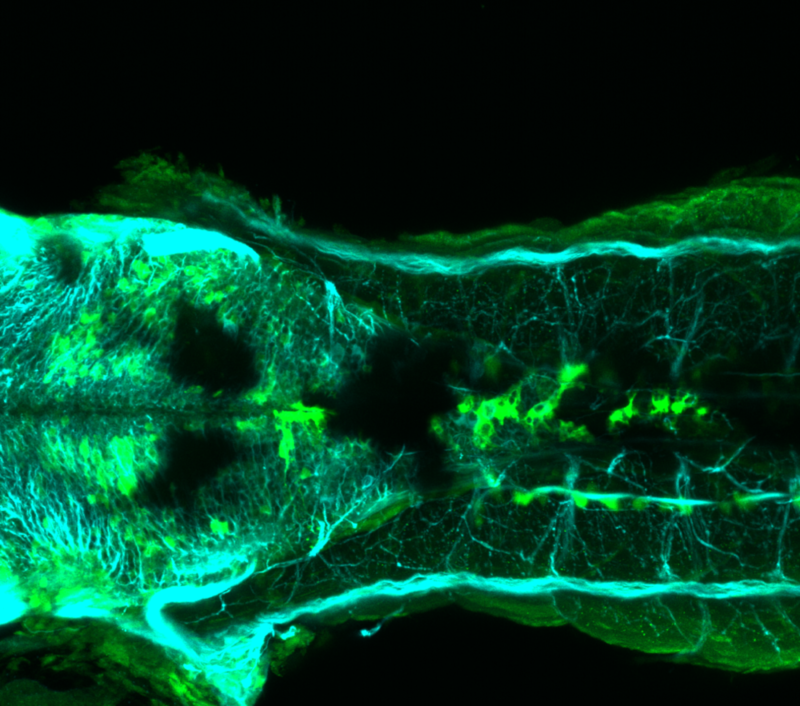 This transgenic line expresses GFP in cranial motor neurons. It was made using a construct that fuses Islet-1 promotor/enhancer sequences to GFP. cranial motor neurons, hindbrain, subpallium, preoptic area. 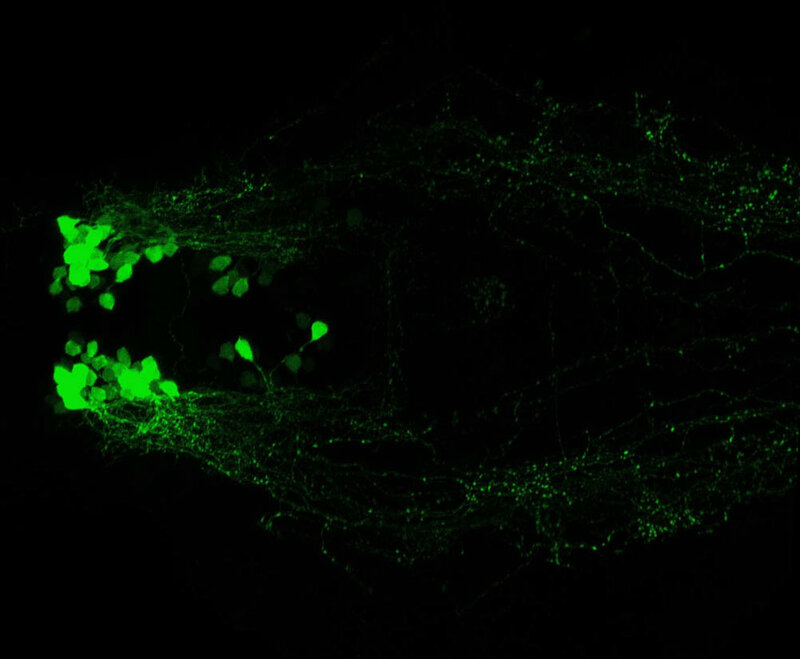 Visualization of cranial motor neurons in live transgenic zebrafish expressing green fluorescent protein under the control of the islet-1 promoter/enhancer. Netrin/DCC signaling controls contralateral dendrites of octavolateralis efferent neurons. The Journal of neuroscience. 26(51):13328-13337. Gaze-stabilizing central vestibular neurons project asymmetrically to extraocular motoneuron pools. The Journal of neuroscience. 37(47):11353-11365. Cadherin-2 Is Required Cell Autonomously for Collective Migration of Facial Branchiomotor Neurons. Vagus Motor Neuron Topographic Map Determined by Parallel Mechanisms of hox5 Expression and Time of Axon Initiation. Current biology : CB. 27(24):3812-3825.e3. Diverse mechanisms for assembly of branchiomeric nerves. 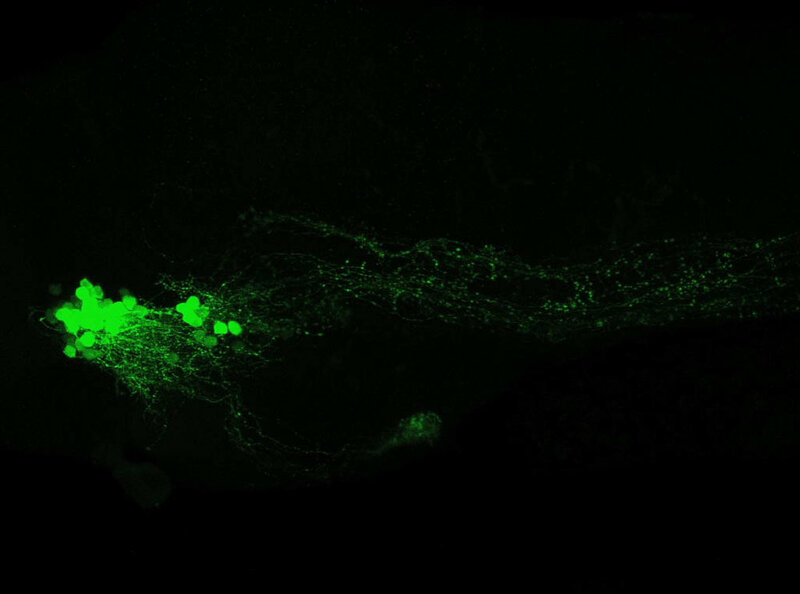 This transgenic construct drives GFP expression in oxytocin expressing neurons in the neuro-secretary pre-optic area(NPO) part of the neuroendocrine system. preoptic area, neurosecretory preoptic area (NPO). The hypothalamic neuropeptide oxytocin is required for formation of the neurovascular interface of the pituitary. 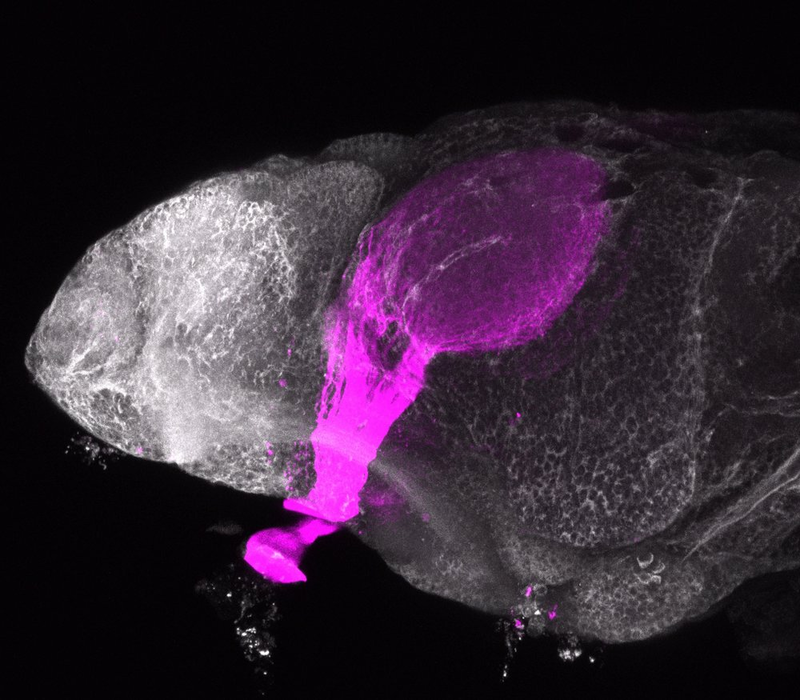 Development of the zebrafish hypothalamus. Annals of the New York Academy of Sciences. 1220(1):93-105. Enhancer trap line from Vladimir Korzh lab that has EGFP expression in the roof plate. Kondrychyn, I., Teh, C., Sin, M., and Korzh, V. (2013) Stretching morphogenesis of the roof plate and formation of the central canal. PLoS One. 8(2):e56219. This construct contains the highly conserved noncoding element "hs5" from the regulatory region of the human SOX3 gene. Dorsal diencephaln showing the midleing pineal organ and asymmetric parapineal on the left. Navratilova, P., Fredman, D., Hawkins, T.A., Turner, K., Lenhard, B., and Becker, T.S. (2009) Systematic human/zebrafish comparative identification of cis-regulatory activity around vertebrate developmental transcription factor genes. Developmental Biology. 327(2):526-540. 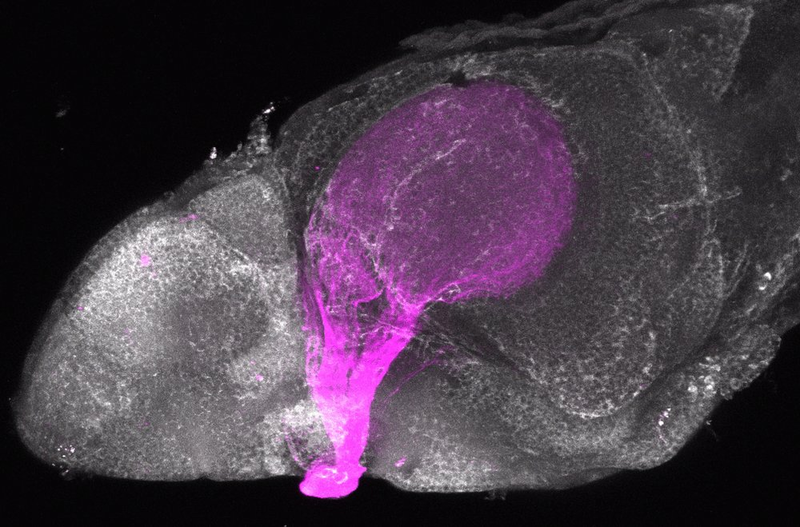 The hedgehog family of genes encodes a group of morphogenic preoteins that have a critical role in the development and patterning of midline brain structures and other systems. In zebrafish two of the three vertebrate hh genes are duplicated shha and shhb. 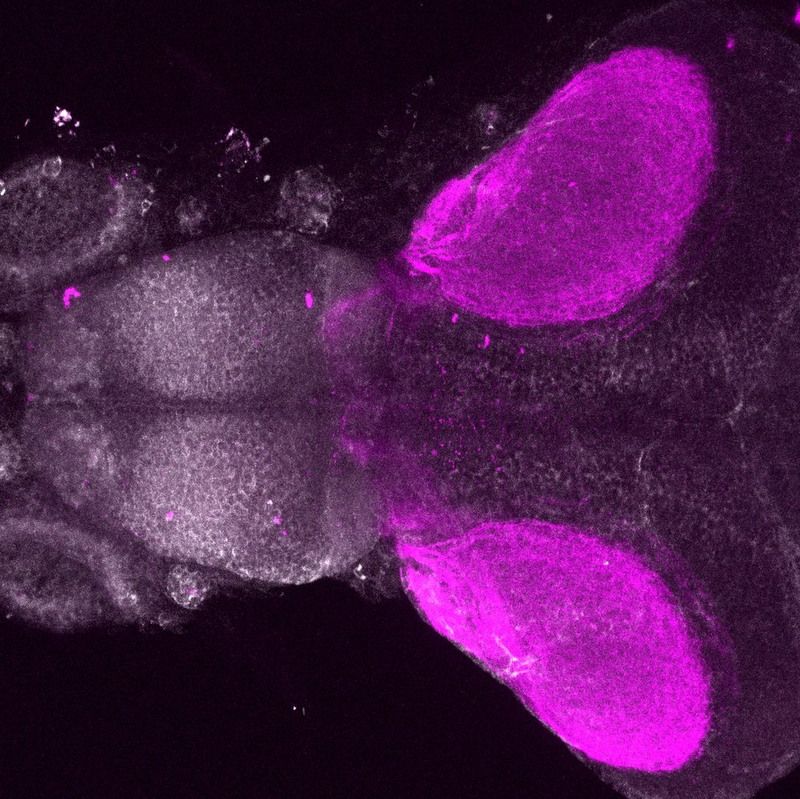 This trangenic from the Nüsslein-Volhard lab has been used to study the role that Shh plays in patterning both the retina and the diencephalon. 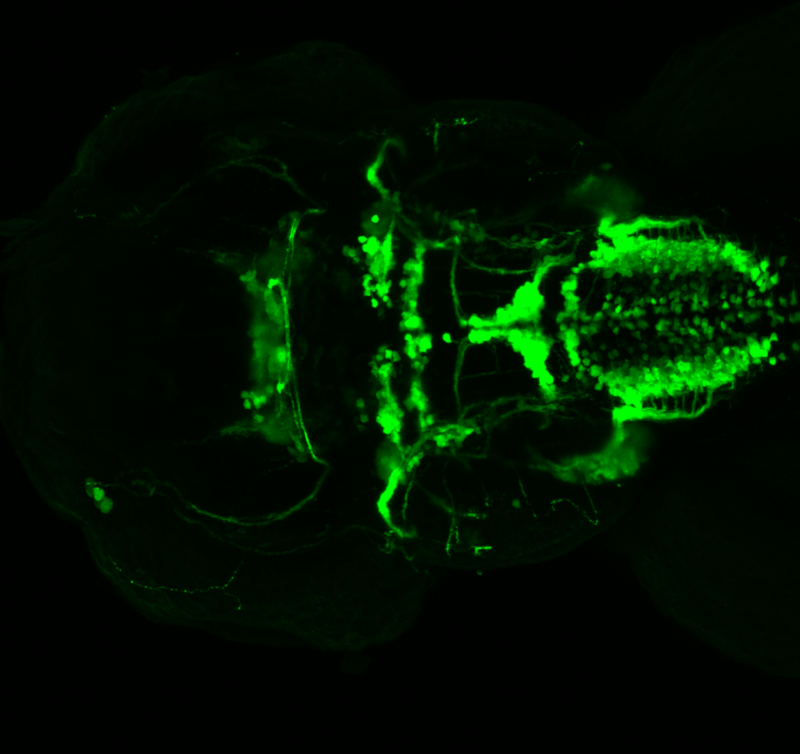 All images of shh:GFP were produced by Monica Folgueira. 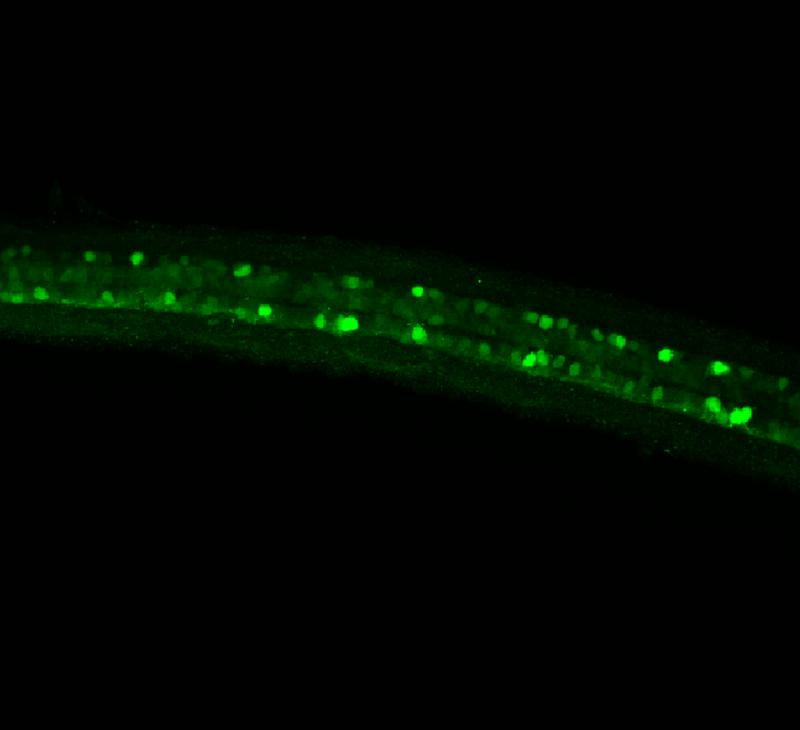 shh:GFP, tublin and sytox at 4.5dpf showing GFP + processes innervating the telencephalon. Shows expression in floor plate and zona limitans intrathalamica. basal plate midbrain, zona limitans intrathalamica, prethalamus, retina. Neumann, C.J. and Nüsslein-Volhard, C. (2000) Patterning of the zebrafish retina by a wave of sonic hedgehog activity. Science (New York, N.Y.). 289(5487):2137-2139. 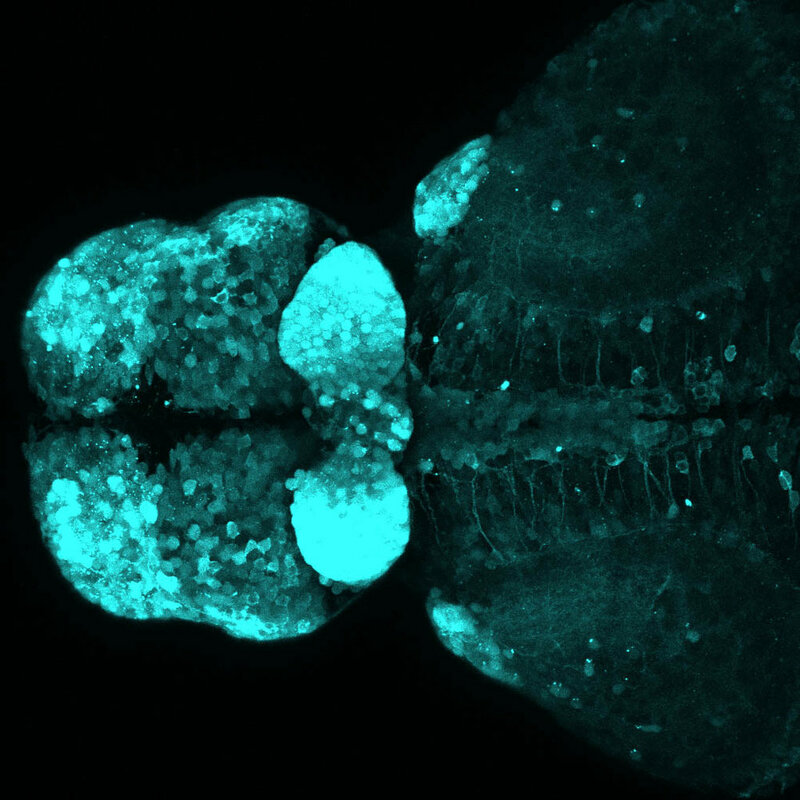 This transgenic originates from Herwig Baier’s laboratory and is one of many enhancer trap Gal4 lines created by them. Driving Kaede expression in the posterior tuberculum,hypothalamus and cerebellum. There is a very interesting tract labelled that projects between the midbrain tegmentum and posterior tuberculum. The tract skirts the tectal neuropil. The insertion of this transgene is currently unmapped. tectum, posterior tuberculum, tegmentum, hypothalamus, cerebellum. Scott, E.K., and Baier, H. (2009) The cellular architecture of the larval zebrafish tectum, as revealed by gal4 enhancer trap lines. Frontiers in neural circuits. 3:13. Heap, L.A., Goh, C.C., Kassahn, K.S., and Scott, E.K. (2013) Cerebellar output in zebrafish: an analysis of spatial patterns and topography in eurydendroid cell projections. Frontiers in neural circuits. 7:53. Heap, L.A., Vanwalleghem, G.C., Thompson, A.W., Favre-Bulle, I., Rubinsztein-Dunlop, H., Scott, E.K. 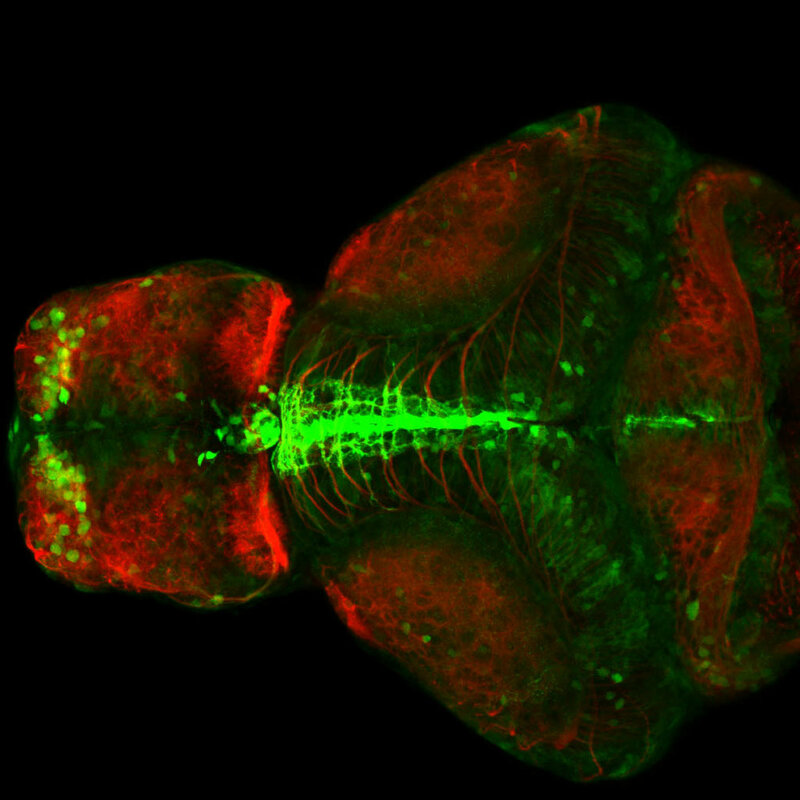 (2018) Hypothalamic Projections to the Optic Tectum in Larval Zebrafish. Frontiers in Neuroanatomy. 11:135. Kani, S., Bae, Y.K., Shimizu, T., Tanabe, K., Satou, C., Parsons, M.J., Scott, E., Higashijima, S.I., and Hibi, M. (2010) Proneural gene-linked neurogenesis in zebrafish cerebellum. Developmental Biology. 343(1-2):1-17. 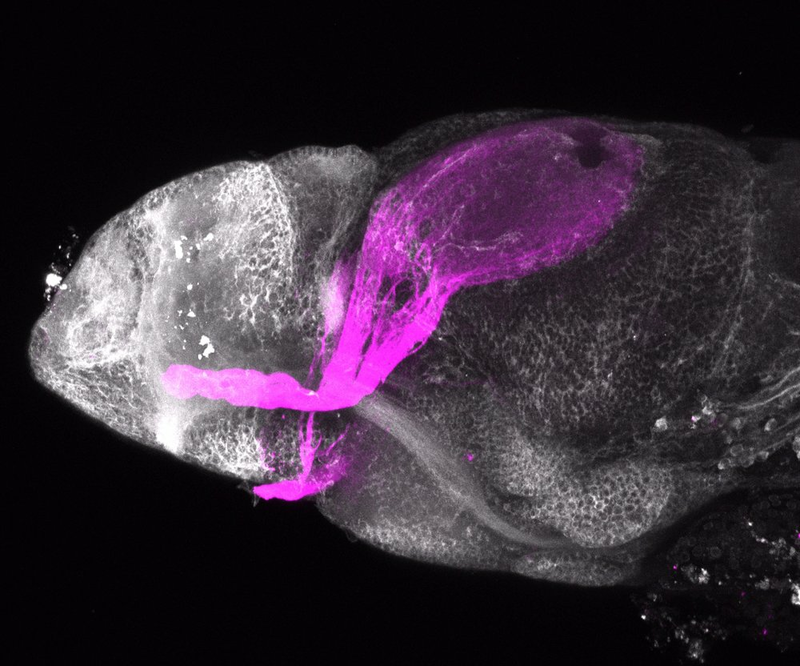 This transgenic originates from Herwig Baier’s laboratory and is one of many enhancer trap Gal4 lines created by them. It shows dense expression of kaede in the telencephalon and throughout all the habenula subnuclei. The insertion of this transgene is currently unmapped. Showing broad telencephalic expression. Also expresses GFP in the habenula, posterior tuberculum and hypothalamus. Mason, L., Scott, E.K., Staub, W., Finger-Baier, K., and Baier, H. (2009) Expression patterns from GAL4 enhancer trap screen. ZFIN Direct Data Submission. . (http://zfin.org). 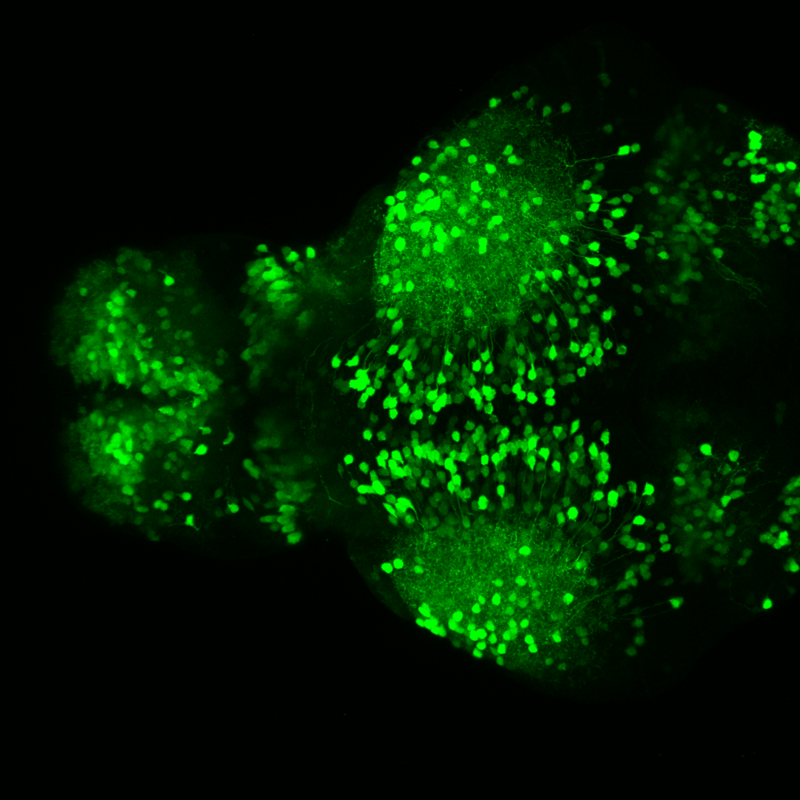 Tg(1.4dlx5a-dlx6a:GFP)ot1 larvae express GFP in subpallial neurons γ-aminobutyric acid (GABA)-expressing neurons. 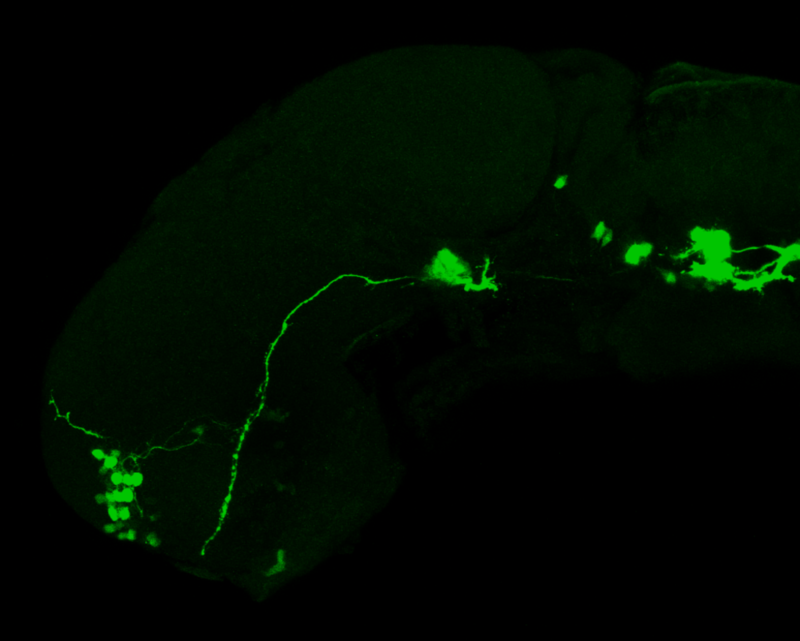 Several other brain regions also show GFP expression in this transgenic line such as the optic tectum and cerebellum. Dlx homeobox genes play essential roles in the differentiation, migration and survival of subpallial precursor cells that will later give rise to diverse subtypes of γ-aminobutyric acid (GABA)-expressing neurons. They also participate in the regulation of the Gad genes encoding the enzymes necessary for GABA synthesis (Yu et al., 2011). 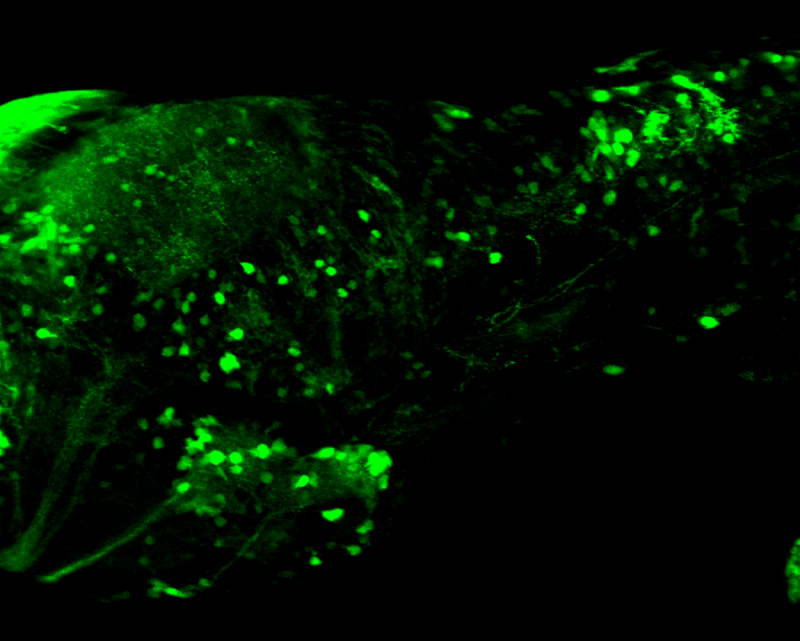 Mouse over the different areas of GFP expression in the interactive images below to see the name of the brain area. 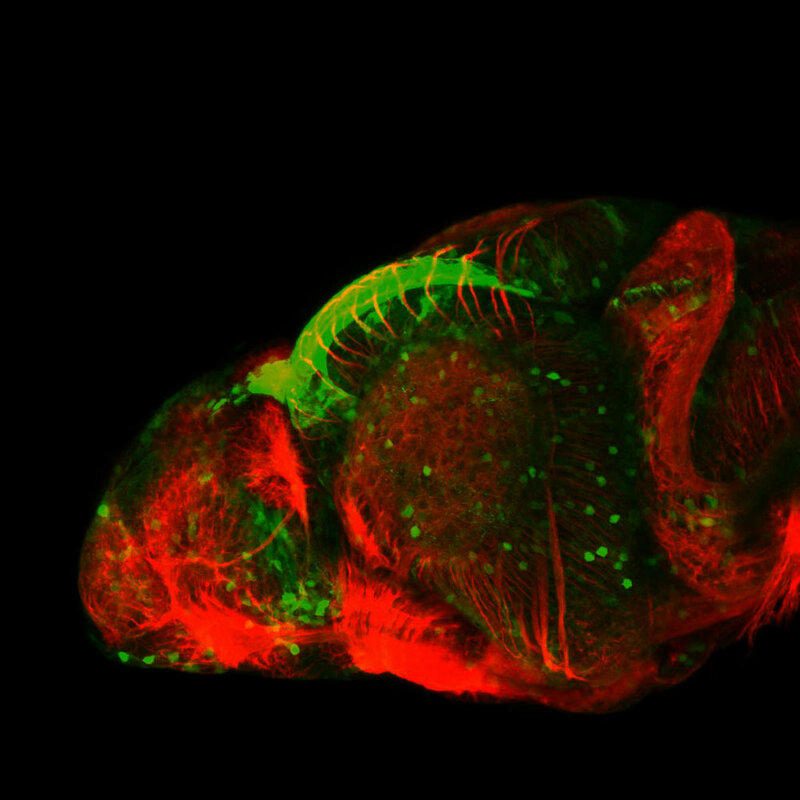 dorsal view of a 4dpf Tg(1.4dlx5a-dlx6a:GFP)ot1 larvae labelled with anti-GFP(green), SV2(cyan) and tubulin(red) antibodies. Lateral view of a 4dpf Tg(1.4dlx5a-dlx6a:GFP)ot1 labelled with anti-GFP and anti-tubulin(cyan). 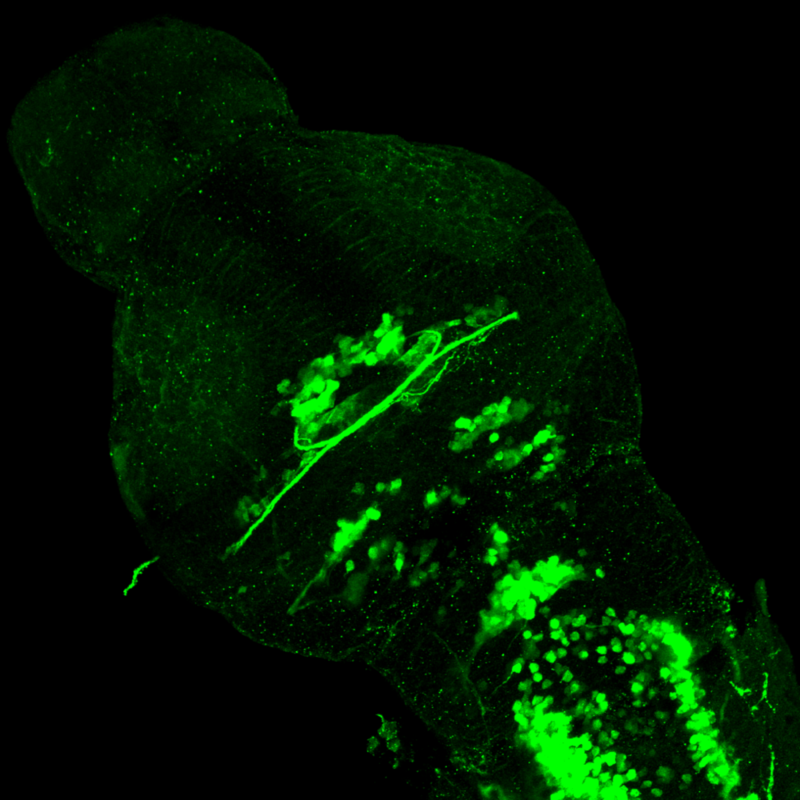 Lateral view of a 4dpf Tg(1.4dlx5a-dlx6a:GFP)ot1 labelled with anti-GFP. 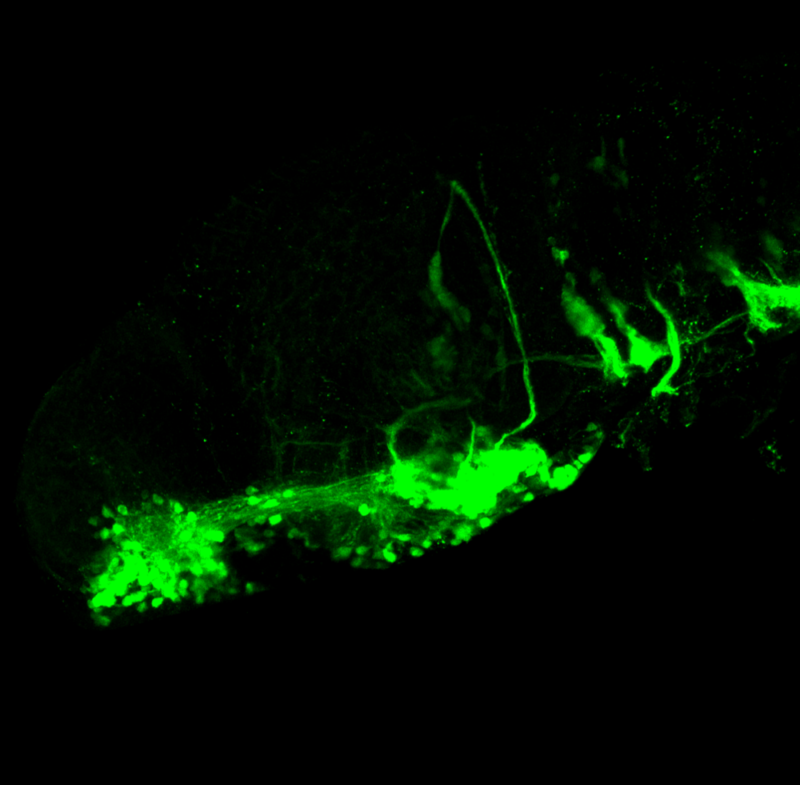 Ventral view of a 4dpf Tg(1.4dlx5a-dlx6a:GFP)ot1 larvae labelled with anti-GFP(green). 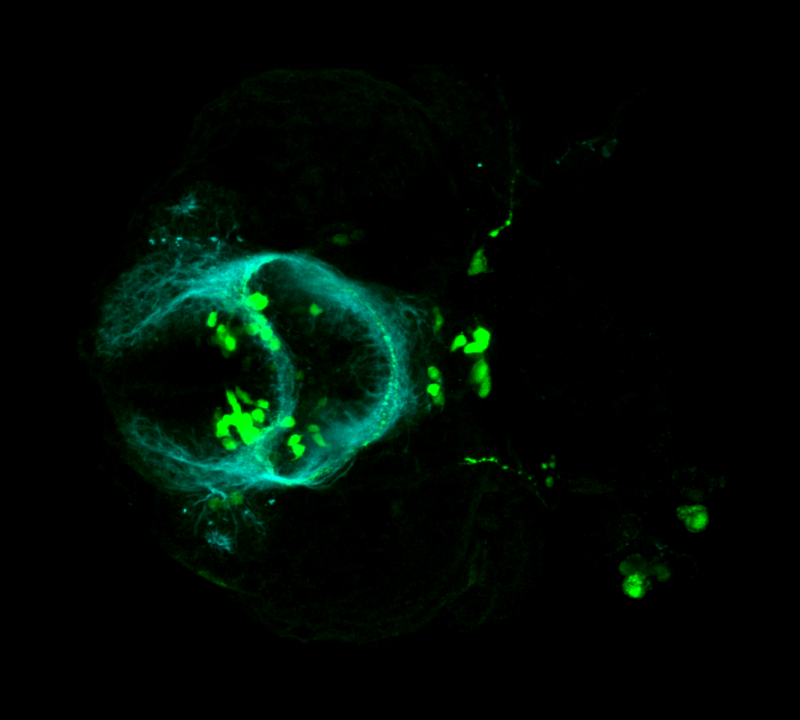 Ventral view of a 4dpf Tg(1.4dlx5a-dlx6a:GFP)ot1 larvae labelled with anti-GFP(green) and anti-tubulin antibodies. 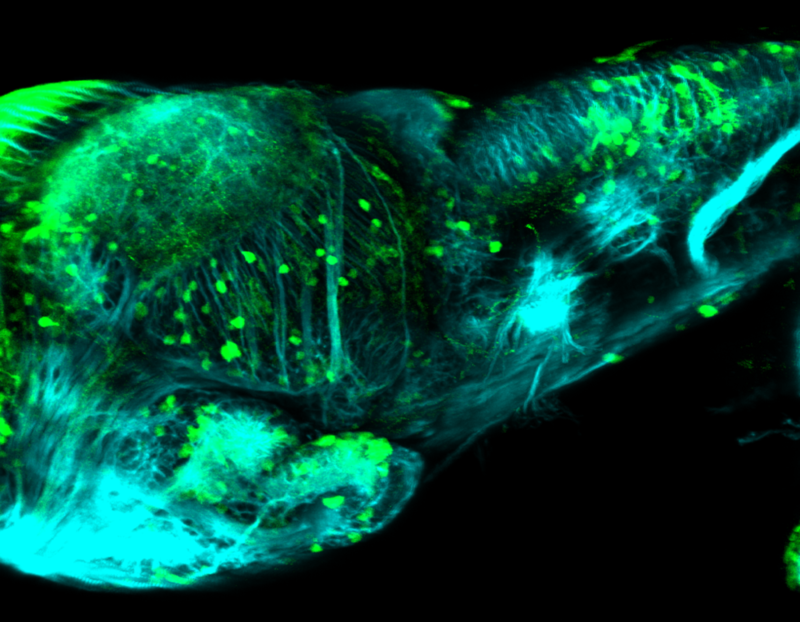 Dorsal view of a 4dpf Tg(1.4dlx5a-dlx6a:GFP)ot1 larvae labelled with anti-GFP(green) and tubulin(cyan) antibodies. 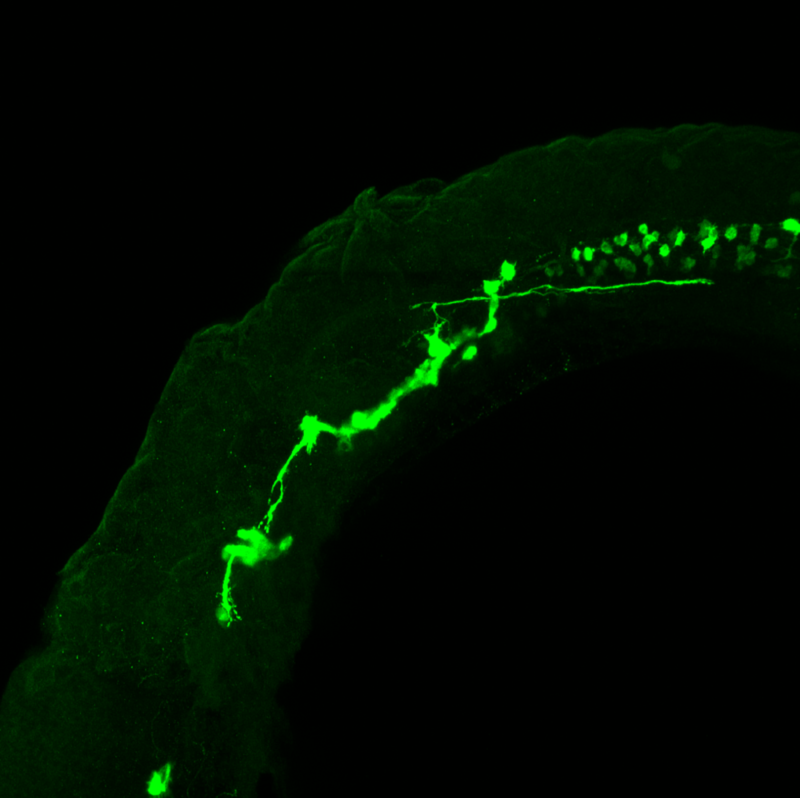 Frontal view showing the GFP +processes of olfactory bulb interneurons innervating the glomeruli. 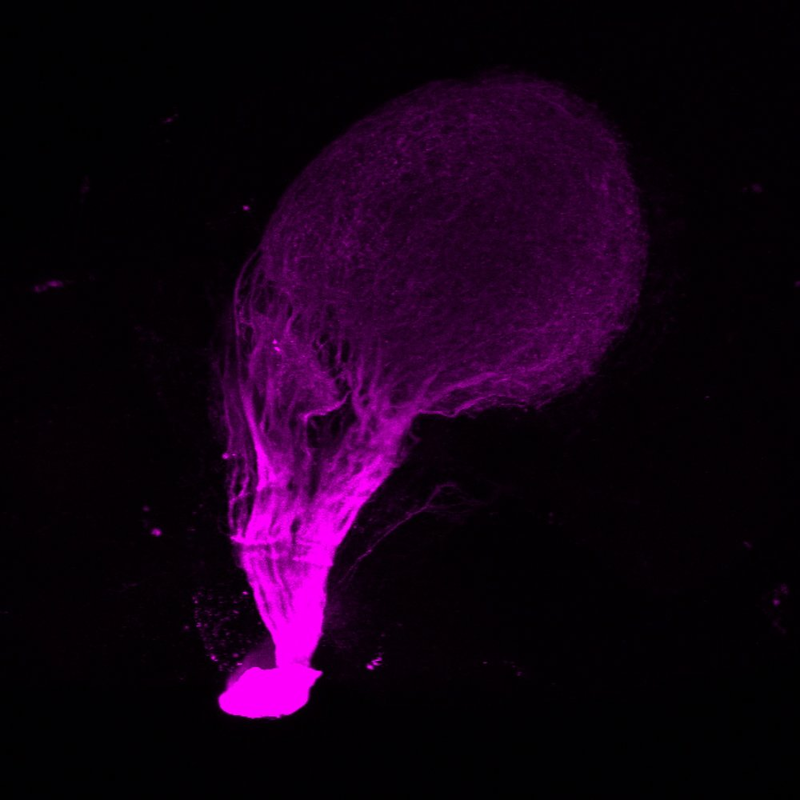 Tubulin shows the longitudinal axon scaffold formed by this early stage. Several clusters of dlx:GFP + cells are present in the telencephalon, diencephalon, midbrain and hindbrain. single section through a 4dpf olfactory bulb. 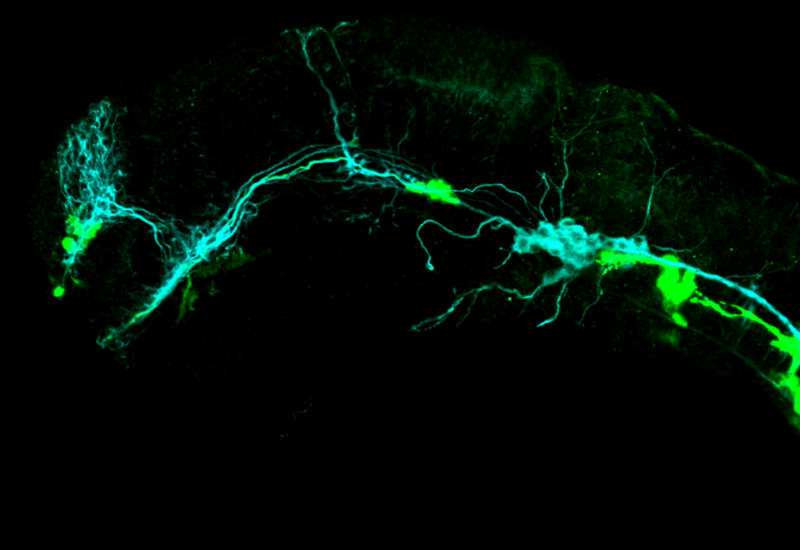 Showing many GFP+ neurons in the optic tectum and cerebellum. Shows cells throughout the subpallium and preoptic area and hypothalamic lobes. 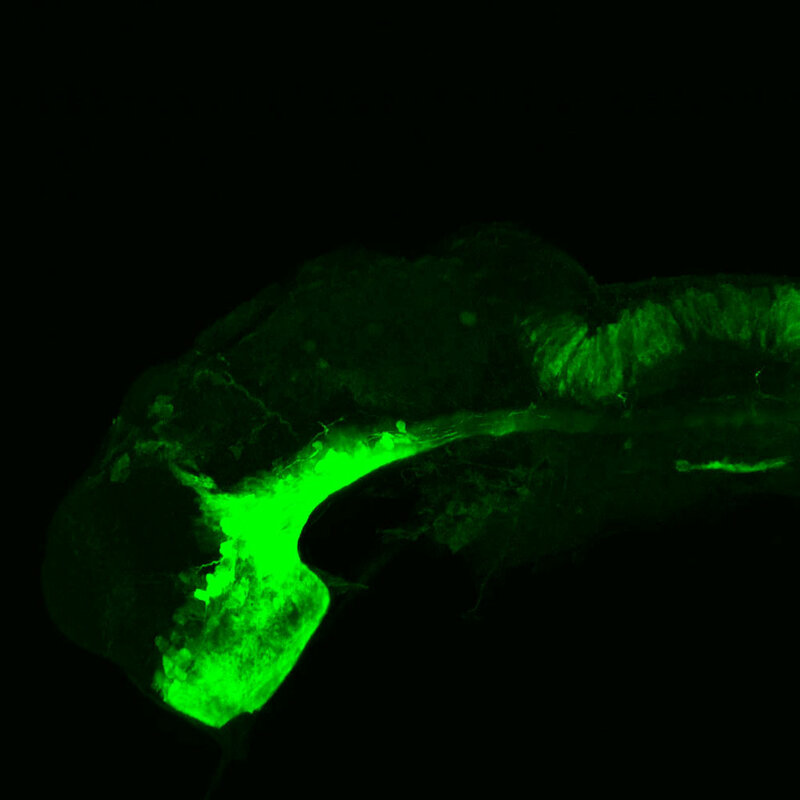 showing dense cluster of GFP+ cells in cerebellum and scattered cells in the spinal cord. Shows tectal and pretectal expression. olfactory bulb, subpallium, pallium, preoptic area, prethalamus, posterior tuberculum, hypothalamus, optic tectum, cerebellum. A highly conserved enhancer in the Dlx5/Dlx6 intergenic region is the site of cross-regulatory interactions between dlx genes in the embryonic forebrain. The Journal of neuroscience : the official journal of the Society for Neuroscience. 20(2):709-721. 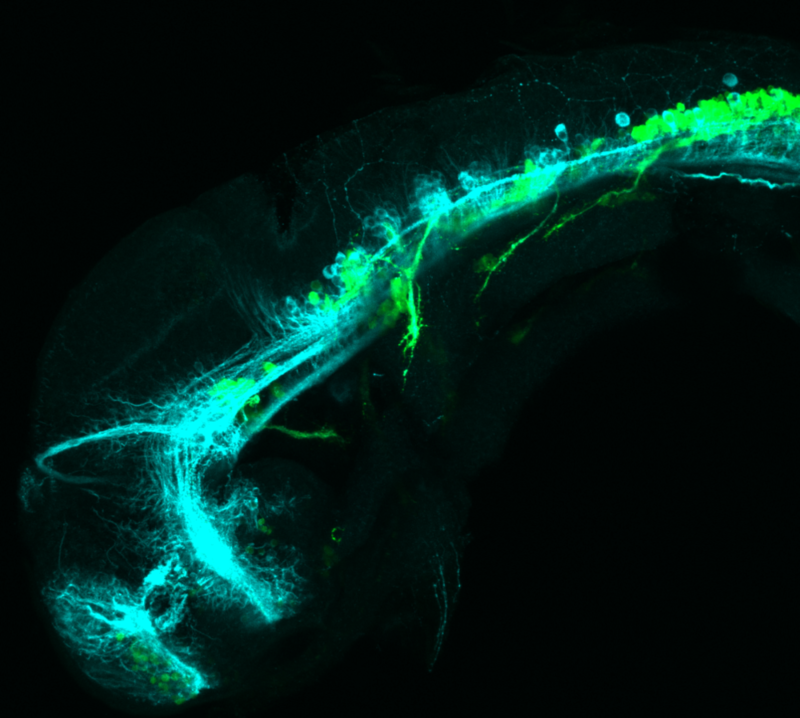 Activity of dlx5a/dlx6a regulatory elements during zebrafish GABAergic neuron development. Int. J. Dev. Neurosci.. 29(7):681-91.